Description: The Oberon is the only place one can still find the American Dream alive and well. Thousands of settlers from America have come to live in this mysterious land accessed only by an energy portal in the South Pacific. The settlers are there to mine orichaclum- a mineral that can give even the casual user magical powers - and to reap the strange high tech salvage that litters the dead cities of an extinct human civilization. Sarah Orange, a young and troubled girl from Southern California, is one of those settlers. Facing a futureless existence in modern day America and betrayed by her long time boyfriend, Sarah takes off to The Oberon and falls in with a group of illegal salvagers that operate in the dead cities only at night. Facing death, betrayal, and the heavy hand of her corporate overseers as well as the murderous hatred of the alien Oberon natives that live a medieval existence, Sarah searches for love and money in a world so close to- and yet so different from- our very own. It's my book so yeah it's cool.
" 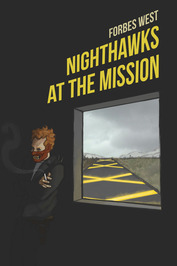 Nighthawks at the Mission is FREE to download to a Kindle or Kindle app until Midnight, August 3rd, 2013. The Oberon is the Nighthawks at the Mission is FREE to download to a Kindle or Kindle app until Midnight, August 3rd, 2013. The Oberon is the only place one can still find the American Dream alive and well. Thousands of settlers from America have come to live in this mysterious land accessed only by an energy portal in the South Pacific. The settlers are there to mine orichalcum- a mineral that can give even the casual user magical powers - and to reap the strange high tech salvage that litters the dead cities of an extinct human civilization. Sarah Orange, a young and troubled girl from Southern California, is one of those settlers. Facing a futureless existence in modern day America and betrayed by her long time boyfriend, Sarah takes off to The Oberon and falls in with a group of illegal salvagers that operate in the dead cities only at night. Facing death, betrayal, and the heavy hand of her corporate overseers as well as the murderous hatred of the alien Oberon natives that live a medieval existence, Sarah searches for love and money in a world so close to- and yet so different from- our very own. Nighthawks at the Mission is an epic, fantasy, sci-fi, tour-de-force. It is also a slightly demented, scatter-brained, fragmented, meme-dropping, allusion-riddled, drug-addled, Jack Kerouac-like, stream-of-consciousness mind thumping that dares you to "get it. "- *****, Michael Bunker, author of Wick and The Silo Archipelago. "Okay Hunter S. Thompson. Keep up with me." It's too well-written. The story is too dense and elaborate to have come from the mind of some obscure, anonymous, independent writer. -*****, Max Zaoui.
" Pickle wrote: "Forbes wrote: "Robocop 2. Robocop has to fight a drug lord who's basically an upgraded Robocop. Just because." i hated robocop 2 after Pickle wrote: "Forbes wrote: "Robocop 2. Robocop has to fight a drug lord who's basically an upgraded Robocop. Just because." i hated robocop 2 after loving the first film"
Yeah, I just consider it an unintentional parody. They fucked up Robocop hard on that one, Robocop 3 don't get me started... ...more "
" Lamora/Ches wrote: "Currently reading Cloud Atlas which is being a fantastic read so far (I also liked the film adaptation very much). The Diamond Age Lamora/Ches wrote: "Currently reading Cloud Atlas which is being a fantastic read so far (I also liked the film adaptation very much). The Diamond Age and The Moon is a Harsh Mistress are next on the list!" Moon is harsh mistress is a great classic. Good choice. Can't buy everything Heinlein is hashing out but still very intersting stuff. ...more "
" Dara wrote: "I get why she did it. Hell, if I were her I'd do it too. It must be so liberating." I think its good for authors to have pseudonymns. Let' Dara wrote: "I get why she did it. Hell, if I were her I'd do it too. It must be so liberating." I think its good for authors to have pseudonymns. Let's off the personal pressure, I would say and lets them open up creatively. Family and fame can add a lot of baggage. ...more "
" I'd recommend Fallout 3 with all the add ons. Never had so much fun playing a game and getting lost in all the sidetreks. There's some good mods there I'd recommend Fallout 3 with all the add ons. Never had so much fun playing a game and getting lost in all the sidetreks. There's some good mods there too for the PC that really makes the game something else (I forget what it was called but there is one mod that deals with lighting effects that makes the game otherworldy- for example, when its dark its dark and all you have to go by is old streetlights flickering on). ...more "